So what makes Revolution 7 one of the best wedding bands in Scotland? See how many boxes this ticks; 7 great musicians, male and female vocals, a hot horn section with sax and trumpet and a keyboard player who is also a fantastic fiddle player, so a storming ceilidh set is also available as well as modern chart and soul tunes. Truly a band for every occasion. No matter if you love the latest chart hits, classic pop, rock and soul or if you'd prefer a ceilidh, this is a band you must consider. Imagine how good this band will look on stage at your event. There's something about a live band that adds atmosphere and a sense of occasion to any event. With Revolution 7 you'll get a grooving, fun loving band of professional musicians focused on making sure that every one of your guests is having as much fun as they are. 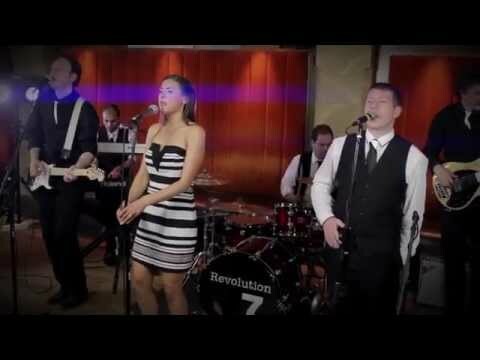 Revolution 7 has performed at most of the biggest and best venues in Scotland, from high end corporate events and party nights through to weddings in castles, 5 star hotels and village halls. There's no kind of event or audience they can't handle. You'll also have the pleasure of dealing with some of the friendliest people you could hope to meet, real professionals who treat your event as if it was theirs. You're probably thinking that all this talent and versatility costs an arm and a leg but you'd be wrong. Revolution 7 represent great value for money; seven musicians, all experts at what they do and offering three bands in one! It's a no brainer. Get an instant quote and availability check right now by filling in the quick enquiry form, or add Revolution 7 to your shortlist for a number of quotes in one go. We were so pleased with Revolution 7. They were on time and set up with absolutely no disruption to our wedding reception. They started by playing our first dance and then straight into a ceilidh managing to persevere with 80+ people that had no idea what to do! The subsequent live set was a perfect mix of songs to suit our party. Thank you so much! Absolutely fantastic band, highly recommended. Thank you! Absolutely brilliant service. We were kept up to date prior to our wedding which was one less thing to worry about. The band were amazing! The variety of set list was brilliant and got everyone up dancing. All the guests raved about them and didn't want them to stop playing. Our band revolution 7 were amazing from start to finish. They were professional and kept our guests fully entertained. Will definitely recommend hire a band to anyone looking to book a band. Thanks. Great service from start to finish. Website was easy to use and any time I phoned I got a friendly and helpful voice. The band was excellent and we got plenty of good feedback from everyone there. Revolution 7 did a great mix of songs and were more than friendly and helpful any time we spoke with them. Thank you to everyone for helping our wedding be a great event. Loved our dance off! And of course......the ladies won! Would recommend the band to anyone and they definitely made our wedding reception perfect! Thanks! Dear Hireaband, Victoria and I would like to pass on our thanks for supplying Revolution 7 for the Courier Business Awards, they went down a storm and played fantastic music and the dancefloor was packed all night. They were extremely lovely people too. Hireaband made it so easy and simple to book our band, it was a very simple, reassuring process and I would definitely recommend Hireaband to anyone. Our band, Revolution 7, exceeded expectations in every way and were hands down the best band we could have hoped for! Just a quick note to say thank you for your performance at our wedding reception in October at Balbirnie. All of our guests have said how much they loved you, and how much of a good time they had dancing to your music. We absolutely loved your sound, even better than we had expected ! You are all clearly such talented musicians and were by far the best wedding band we’d ever heard ! The Ceilidh dances went down a storm, especially with the Dutch guests! It was so much fun it really set the tone for the rest of the night. Will always appreciate you offering to do a few of those dances ! You were really the cherry on the cake, the perfect end to the perfect day. You helped make some wonderful memories that will be treasured forever. The whole experience was brilliant. From booking to performance, Revolution 7 and Hireaband were professional and gave great service. The band itself were brilliant - fun, funky and fabulous! We had a wonderful night and Revolution 7 made it extra special. They seemed to enjoy themselves as much as we did, and everyone was up dancing for most of the night. Superb! Thanks to all the band for making our party rock! Experience with Hire a Band was great - very smooth and helpful considering we were organising from overseas. Very easy to get in touch with the band themselves when we had questions so that was good. Band themselves were fantastic, full of energy and had the guests dancing all night with a lively set. They were very good with email as well. They introduced themselves before playing and were very personable. They were also very patient when we were running a bit late! I am sure the bride requested a song during the night which was accommodated so that was appreciated. On behalf of Petroleum Experts Ltd please can you pass on our thanks to all in Revolution 7 for making our evening at Archerfield on Sunday so much fun. Revolution 7 were just what we needed to get everyone dancing after dinner and the dance floor remained busy for the remainder of the night. We thoroughly enjoyed their music! Just wanted to say a massive thanks to all of you for entertaining us and our guests at our party in Aberdeen last night. It was a great night smile emoticon I lost count of the amount of times people commented on how much they were enjoying the band!! hope you had a safe trip down the road this morning. Thanks once again. Just wanted to drop a quick note to say a (very long overdue!) massive thank you to you and the rest of the band for the fantastic performance at our wedding! You were absolutely amazing - we were so pleased to see the dance floor packed all night and this was down to you guys and the brilliant playlist. We had so many compliments on the band both on the night and afterwards too. I'd also like to say a huge thank you to you personally for your professional approach to organising things - I can assure you this is not standard among wedding suppliers and it was great to know we could rely on you to respond promptly and fully address all our queries. We will definitely recommend you to others - thanks again! 'Great performance last night at the Diabetes UK Hummingbird Ball annual charity event at the Sheraton Hotel Edinburgh. Everyone up dancing and having a great time and buzz created by an excellent band. Grant Stott singing "that's Fife " backed by the band was one of many highlights in the gold star event. Well done; you made this a special evening and the guests did not want you to stop playing. A great band for weddings, corporate events and balls. Hopefully see them playing again soon. Revolution7 are a hugely entertaining and professional covers band -these guys (and girl) are guaranteed to impress. If they have your date available, book them! Just wanted to take time to send a massive thank you for performing at our wedding reception. You and the guys were absolutely amazing and all our guests are still taking about it. You created a fantastic atmosphere and we didn't want the night to end. It's a true testament when I looked at the dance floor to see friends who never normally dance up pulling shapes! It's a night we will both remember forever and a lot of that is down to Revolution 7. Thank you! Thank you so much for recommending Revolution 7 for our wedding 3rd October. They were absolutely amazing and had everyone up dancing all night. It was like a great big party which is exactly what we wanted. Our friends and family can't stop raving about them.